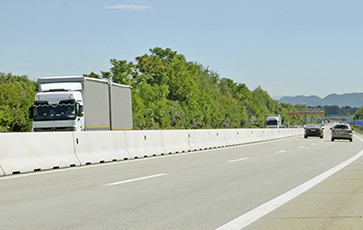 The POWER product line offers maximum safety for roads and constructions. Containment level H4b with low working widths is the strictest requirement of any system, and REBLOC® offers a number of systems for different installation areas including asphalt, concrete, compacted soil and on constructions. All elements can be directly connected with the unique, patented REBLOC® coupling for quick installation and de-installation and Maximum practicability. The consistently strong element chain safely dissipates the forces that occur in case of a vehicle Impact. The system 100SF(S)_8_H4b/W5 is also available as bridge system 100SFA_8_H4b/W4 with anchored position securing and as 100SFP_8_H2/W3 with pin as position securing (without anchorage of the concrete barrier element) for installation on the bridge cap. The system 100SFA_8_H4b/W4 is also available as bridge system 100SFP_8_H2/W3 with anchored position securing on bridge cap, as free standing system 100SF_8_H2/W3 and 100SF_8_H4b/W5 and as symmetric system 100SFS_8_H4b/W5.